Finally finished! I think I started this quilt in October of 2012, so that would make almost four years in the creative/construction phase. Yards and yards of hand dyed fabric, and don’t ask me how many yards, I forgot to keep track. The blocks of the background fabric, which are in the vertical direction, are container dyed and the horizontal blocks are ice dyed. The insert fabrics of various colors are container and iced dyed. When calculating how many blocks I would need, I over estimated and made too many. 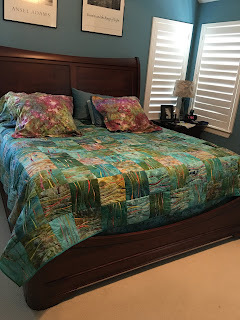 Now I have a throw quilt to match! The Quilter’s Guild of Dallas held a workshop with CarolTaylor in September of 2012. My friend, Lu Peters, asked me to join her in taking this great workshop and it was much-needed day away from the house. This was right after my husband had been diagnosed with Alzheimer’s disease (at the age of 57) and I was just a tad bit stressed. During the workshop I knew I wanted to make a new king size quilt for our bedroom and method grabbed me! Then the decision making process started. What colors for the background? Container or ice dyed? What colors for the inset pieces? Oh, the fun I had being able to spend time with the creative process and in my construction and dye studios. The curved piecing became a refuge and very therapeutic. I would escape to the studio for bits of time, man the rotary cutter and turn on some music or listen to a book. Even when we moved last year, and in an apartment for 7 months, I had my big ironing table in one guest room and my portable sewing table in the other. You would think I would be tired of this method after 258 - 8inch blocks, but I’m not. I have ideas rolling around in my head for another quilt…after I finish some works in progress. Thanks for letting me share the process with you! And yes, the pillow shams are ice dyed also. I just can't stop with the ice dying! Back to School - Free Shipping!